Not just electronics industry, the whole world should be happy for having a material like silicon for making the human life better. This vastly available, fairly strong, and non hazardous material is central to computing and communication revolution we have seen in past 40 years. Engineers could bring down the millimeter measuring transistor to nano meter dimensions. While the semiconductor industry still confident of making chips with line widths down to 7 nm, further integration is becoming extremely difficult with serious limitations in the silicon material itself. Even the lithography process used today to make chips is also becoming difficult to scale down further, both scientifically and economically. To build chips at atomic scale, researchers are exploring new materials which can be assembled at atomic or molecular level. So another new gift to the semiconductor industry now is the carbon material graphene and a derivative of it; the carbon nano tube (CNT). Graphene is produced from Carbon material graphite. Graphite is cheap, abundant, fairly strong and nonhazardous, just like silicon. The problem with carbon nano tubes, which are made using graphene is, making it conduct is easier, but switching off it is difficult. carbon nano tube switch work faster and consume less power compared to silicon MOSFETs. However interesting is this material, researchers are still not able to practically made a carbon nano tube chip, except for the recent attempt by Stanford researchers. The researchers at Stanford University have able to build carbon nano tube (CNT) switch based computer processor chip to do some basic arithmetic logic operations. Stanford University has reported achievements in this area earlier also. 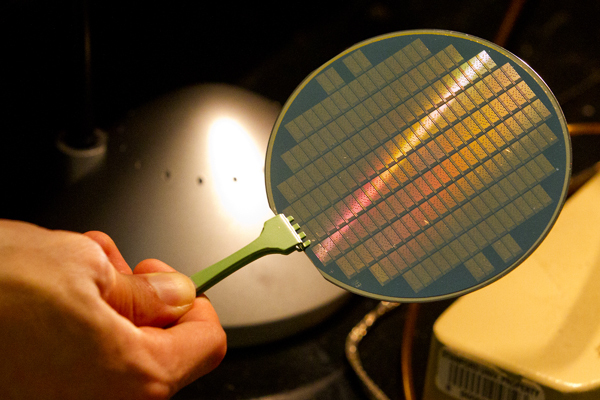 The prototype processor by Stanford researchers will ignite deeper interest in exploring carbon nano tubes for building semiconductor devices of atomic scale. The details of the research was published in Nature journal written by Max Shulaker and other doctoral students in electrical engineering. The research was led by Stanford professors Subhasish Mitra and H.-S. Philip Wong. "People have been talking about a new era of carbon nanotube electronics moving beyond silicon," said Mitra, an electrical engineer and computer scientist. "But there have been few demonstrations of complete digital systems using this exciting technology. Here is the proof." "It's not just about the CNT computer. It's about a change in directions that shows you can build something real using nanotechnologies that move beyond silicon and its cousins. ", adds Mitra. "CNTs are long chains of carbon atoms that are extremely efficient at conducting and controlling electricity. They are so thin – thousands of CNTs could fit side by side in a human hair – that it takes very little energy to switch them off", according to Wong, a co-author of the paper. "CNTs could take us at least an order of magnitude in performance beyond where you can project silicon could take us," Wong said. 1. They could burn up the faulty carbon nano tubes ( the faulty carbon nano tubes are those which behaves like metals instead of semiconductor) by sending high electrical current. 2. In a perfect carbon nano tube -based device, all carbon nano tubes are supposed to be in one geometrical position/direction. The researchers created a powerful algorithm that maps out a circuit layout that is guaranteed to work no matter whether or where CNTs might be askew. "This 'imperfections-immune design' [technique] makes this discovery truly exemplary," said Sankar Basu, a program director at the National Science Foundation. The Stanford team assemble a basic computer with 178 transistors using university's chip-making facilities. Their CNT computer performed tasks such as counting and number sorting. It runs a basic operating system that allows it to swap between these processes. In a demonstration of its potential, the researchers also showed that the CNT computer could run MIPS, a commercial instruction set developed in the early 1980s by then Stanford engineering professor and now university President John Hennessy. If you look at the first silicon IC built by Jack Kilby and Robert Noyce, and compare that to this carbon nano tube computer, there is more confidence in saying that this innovation can power a new wave of semiconductor fabrication, which can produce even smaller, faster, efficient chips using simpler process. The important keywords for the next generation semiconductor fabrication are self-assembly, and the semiconductor materials such as carbon nano tubes supporting self-assembly process. So both material and process becoming important. A $5 billion costing chip fab which needs the sophistication of a spaceship is highly uneconomical way of building nano devices. Nature surely offers a better way/process to build nano devices, which we human beings can research and use that process for building chips. There are less semiconductor equipments available to fabricate chips out of Graphene and CNT. Aixtron is one of the company which has announced systems for fabricating carbon material based chips. Aixtron's BM deposition system can deposit both graphene and CNT materials with precisely controlled critical surface dimensions. The BM system features automatic process control, easy recipe editing, an integrated process camera and remote operation via TCP/IP networking. University of Massachusetts has selected BM deposition system for core research into carbon nano tubes and graphene.